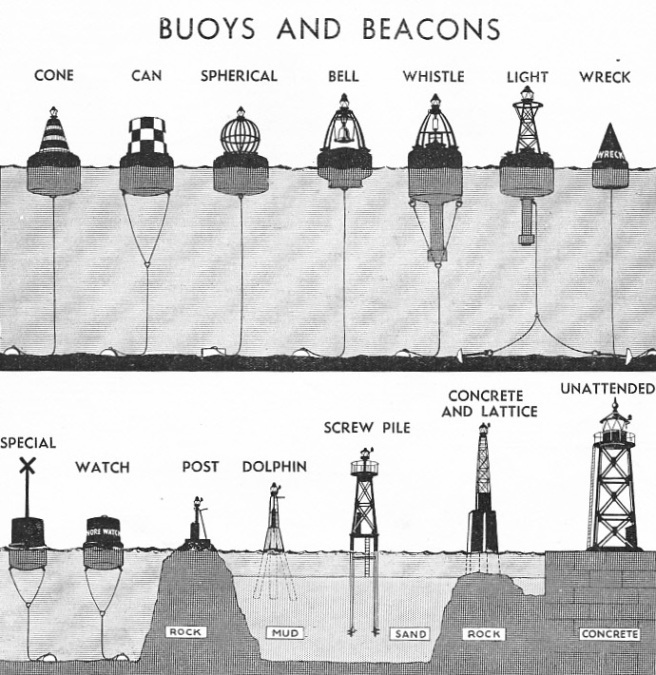 ABOVE are the principal types of buoys and beacons commonly in use in harbours and estuaries. Their designation, according to physical characteristics, is shown, and the type of mooring used may be observed. Cone and can buoys are used for delineating channels along which ships approach port. Spherical buoys indicate the ends of “middle grounds”, ie sand-banks in a fairway. Bell buoys and whistle buoys are used also for marking such channels and give audible as well as visible indication of the positions they guard. The bell operates by the rolling action of the buoy; the whistle is blown by the compression of a column of air in the tail of the buoy as it rises and falls in the sea. Can, Cone and spherical buoys may be lighted or unlighted according to requirements, the gas for operating the lantern being in the body of the buoy. Steel construction is used throughout. Mooring is generally by means of heavy weights as shown, but in certain instances, in exposed positions, mushroom anchors can be employed. Special buoys are used for a variety of purposes as day signs. Watch buoys are anchored near lightships to verify their position. Beacons vary in characteristics according to the ground in which they are fixed. Such lights are automatic. You can read more on “Day and Night Signals at Sea”, “Navigational Charts” and “Signalling at Sea” on this website.